Our Informatica Training in Chennai aims to teach the complete Data Warehousing Concepts in a easier way. 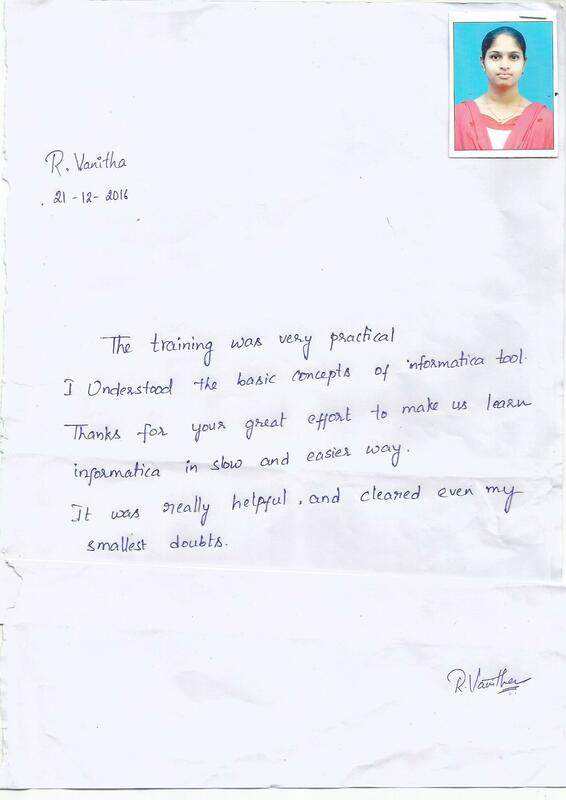 We are the Best Informatica Training Institute in Chennai in-terms of syllabus and expert teaching. We are covering almost all the transformations which is required for companies in Informatica. Informatica® is one of the leading data integration software available in the IT market today. Each passing day, more and more companies are joining the Informatica band wagon for achieving Data Warehousing through ETL. Informatica is one of the most widely used ETL tools for data warehousing and business intelligence. This is the tool that provides DW solution to more than 70% of all DWBI projects today. Informatica is emerging in the market and overcoming all challenges of DWBI compared to any of its competitors. If you are looking forward to a promising career in DWBI look no further this is your tool and we are your destination. Informatica® is one of the fastest growing ETL tools and is way ahead in terms of market and business than any other ETL tool today. Here at Besant Technologies we will help you master this tool with interactive sessions. The advantage of mastering Informatica® here is that, the sessions will be covered by faculty working in live ETL projects thus giving you an insight into how this ETL tool used in today’s business. So if you are looking for a promising IT career for a long time, then look no further, ETL is your answer and Besant Technologies is your solution. Please feel free to contact us for any further queries and we will connect you with our faculty. We have weekly demo classes for Informatica, do feel free to give us a call and drop in. I am Raja Praveen.N. As I have IT experience I liked to improve my skills. For Database stuffs ,I knew SQI,PISQI & Unix shell scripting. 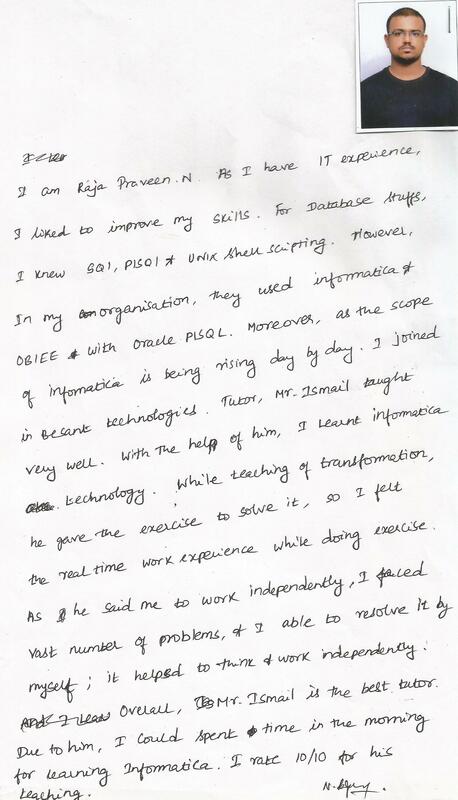 However in my organization, they used informatica & OBIEE with oracle PISQL. Moreover as the scope of informatica is being rising day by day.I joined in Besant Technologies. Tutor Mr.Ismail taught very well. With the help of him ,I learnt informatica technology. While teaching of transformation, he gave the exercise to slove it,so I felt the realtime work experience while doing exercise.As he said me to work independently, I faces Vast number of problems,& I able to resolve it by myself.it helped to think & work independently. Overall Mr.Ismail is the best tutor. 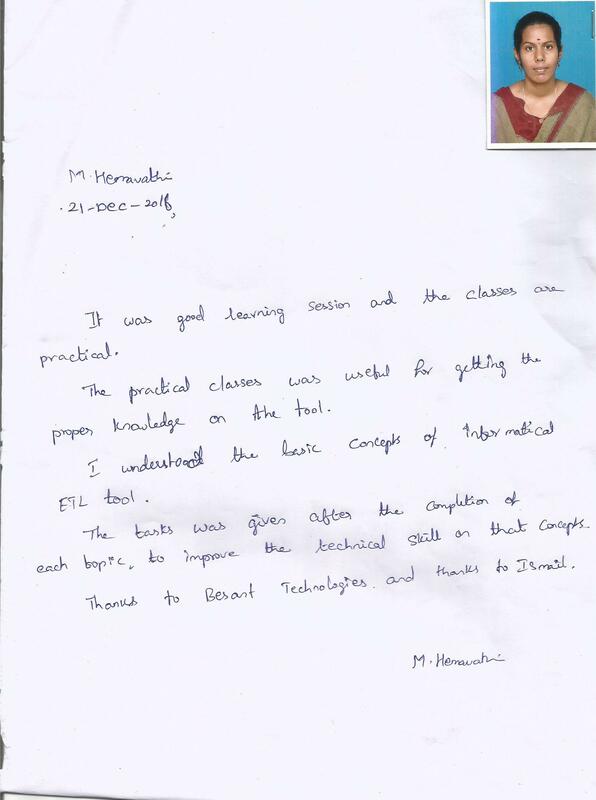 Due to him I could spent time in the morning for learning Informatica.I rate 10/10 for his Teaching. It was good learning session and the classes are practical.The practical classes was useful her getting the proper knowledge on the tool.I understood the basic concepts of informatical ETL tool.The Tasks was given after the completion of each topic,to improve the technical skil on that concepts.thanks to besant technologies and thanks to ismail. The Training was very practical .I understand the basic concepts of informatica tool.Thanks for your great effort to make us learn informatica in slow and easier way.It was really helpful,and cleared even my smallest doupts.